Well at least you can, if your home has become a Bed & Breakfast. Our family home in Mount Airy, NC has become the Sobotta Manor Bed and Breakfast. 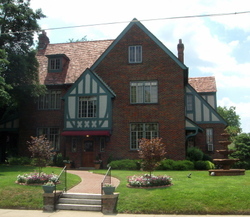 We still have relatives in the Mount Airy area so when we were invited to our nephew's wedding, we accepted a long standing invitation from Robin Hester, the new owner, to spend a couple of nights at 347 West Pine Street. Robin and her husband, Thurman, have done a masterful job of restoring the glory to our former PIne Street home. The rooms are beautifully redecorated while staying true to the character of the house. While at first it might seem a little strange to go back to your former home, Robin is such a gracious host that we felt right at home. We even got to enjoy her wonderful companion and pet, Cher who welcomed us each time we came back to the house. My mother was a wonderful cook and Robin has continued the tradition. The first morning we were there we enjoyed wonderful french toast stuffed with cream cheese and accompanied by homemade sausage. 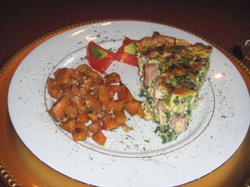 The picture to the left is the second day's breakfast which was a broccoli and ham quiche served with some wonderful sweet potatoes. Each breakfast also included a fruit dish and a warm pastry. The meals were certainly in the tradition of the great ones that my mother had served in the same dining room. Robin and Thurman have also brought back the lovely formal gardens that my mother dedicated so many years to creating. The yard and gardens behind our former Pine Street home are a wonderful oasis of peace and green space. My mother would be especially proud of Robin's driveway gardens which are producing an amazing harvest of tomatoes and other vegetables. If you are looking for a relaxing day trip in North Carolina, give Robin a call at (336) 786-2777. Mount Airy has some interesting shops within walking distance of Sobotta Manor. There is also a great day trip for North Carolinians who haven't visited Chateau Morrisette on the Blue Ridge Parkway just north in the Virginia mountains. I would have to give Sobotta Manor a five star rating.